We are producers and importers of dried herbs, spices, vegetables and fruit. We specialise in the growing of parsley and other English Herbs, while maintaining extensive stocks of a very broad range of imported goods. 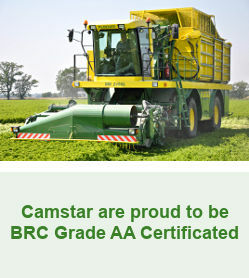 To help achieve our aim of complete customer satisfaction Camstar Herbs has developed a custom built harvesting machine which picks the herb leaves to be dried, thereby enhancing the quality of the finished leaf flakes. 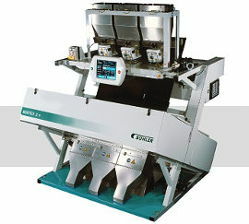 This is a way of harvesting which gives the option of tailoring the bulk index to suit individual Camstar customers' specific jar fill requirements. The superior leaf quality obtained also enhances the appearance of the final product, with colour separation equipment removing any remaining discoloured leaf. In-line heat treatment ensures that Camstar Herbs can supply very low microbiological levels. Our state of the art Ploeger harvester at work in the parsley field.